411 At the halfway mark of my Boston trip we went to Cape Cod for some camping and fresh air. Now, just because we are camping does not mean we are missing starting our day with some delicious brunch. So, one morning we drove into town looking for anything legit. Normally, I do research on these things but I didn’t think ahead so we took to the look around and waited for our spider senses to start tingling. 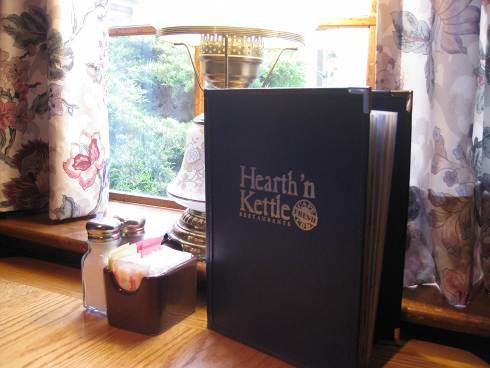 It is that approach that brought us to Hearth and Kettle. 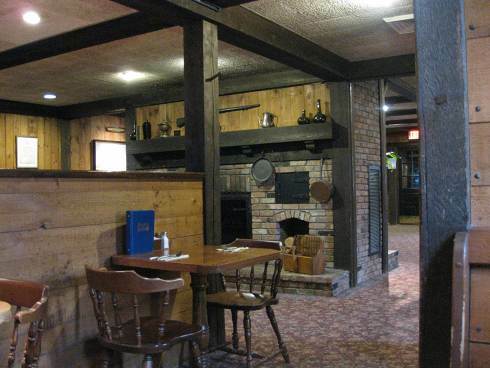 at 1st We ended up at the South Yarmouth location and we walked into this enormous spot that had a kind of log cabin look to it. It was fully wheelchair accessible. They also offer breakfast/brunch 7 days a week which is helpful since we ended up there on a Monday morning. To top that off, many of their breakfast items are served all day so if you are craving pancakes at 6pm, look no further. 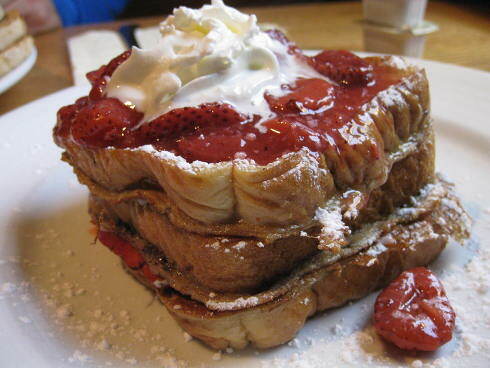 I had the stuffed French toast ($7.99) that came with three fair sized slices topped with strawberries and whipped cream. This dish was sweet and good to the last bite. The strawberries were caramelized but not sweetness overload. They could be found between the slices so you got lots of them everywhere. The three slices were very generous and the price was quite fair. Like I said, the bread slices were of decent size so by the end I was very full. Batata started with the vegetarian omelette and he had them add an extra egg ($10.69). This dish came with a generous side of their special home fries, a choice of bread (marbled was chosen) and the omelette. The potatoes were called pilgrim fries and had peppers, onions, sour cream and scallions. The omelette was tasty and filling and it was larger than it looked in the picture because of the large amount of potatoes. The marbled bread was a nice option to have and the potatoes will be reviewed by our resident potato expert Batata. These are home fries with sausage, peppers, onions and cheese sauce. I asked to remove it from the potatoes since I am pescatarian (vegetarian that eats fish) but all they did was just remove the sausage and kept all the sausage juice and bits there. It is ok since I am not an inflexible pescatarian but can definitely see how this would have been problematic for others. The home fries are absolutely fantastic! So much cheese and other elements included in these home fries. These hand cut mini-potatoes were with the skin still left on, all the while oven-roasted in the sausage oil fat along with the other ingredients. The white coloured processed American cheese was dropped at the last minute providing a Cheez Wiz consistency. The substitute of regular home fries for the pilgrim fries for an additional cost was definitely worth it. The American-sized portion was definitely hefty but I found that they were overly-roasted probably due to the sausage oil. I give it a rating of 3.75 out of 5.
service Our waitress was very nice as she gave some in depth description on some of the dishes. She checked up on us and made sure we had all we needed. She left us the coffee thermos which is a big plus in my books although, it decreases the amount of time she checked up on us but, to be honest, I usually only need coffee refills so the thermos fixed that for me. veg Lots of the menu options can be vegetarian friendly and you have a large omelette section so you do have choice. Vegan options aren’t really available. Wrap up I was glad we found this place. 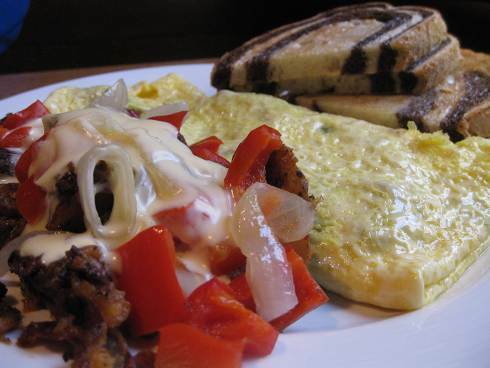 We got a hearty, tasty and filling breakfast for a pretty good price. I would have liked to have coffee included but the dishes were all under $10 so it kind of evens out.